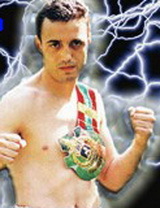 Mourad Sari was an A class champion France in 1992 and 1993, in 1994 he made his first fight in Thailand at a huge gala in the north to Chiang Rai to over ten thousand spectators. Rambowjeaw was sort of the spiritual predecessor to Bovy Sor Udomson with his all out forward only attack. The two met and fought at the S-1 2004 tournament in the B-divison. ~ by fatsoking on February 17, 2011.